While it is easy to sow Papaver somniferum seeds directly into your garden, to get some early flowers in your borders you can also sow plants in seed trays to help germination along. This is a great way of carefully nurturing plants whilst the lingering frosts of spring remain. It is also ideal if you have specific seed varieties that you want to plant into the garden in a specific design. And with Breadseed poppies germinating and growing so easily, starting them off in seed trays will help you grow a lot of healthy and strong specimens which will fill your garden with blooms later in the year. Due to their small size, Papaver somniferum seeds are best sown in an open seed tray rather than a modular one. Whilst modular trays can be used if they’re all you have, they have a couple of draw backs. Firstly, scattering the seed in a modular tray often results in many seeds collecting around the edges of each separate unit and consequentially several seedlings may germinate in the same few millimeters of soil. It is also harder to prick out seedlings when they’ve been sown in modular trays, causing you more work after germination has started. For the best results you should use a seed tray without partitions which has been filled with a seed compost or suitable alternative. As the seeds of Breadseed poppies are so small, don’t try and plant each one separately. Instead, simply pour some seeds into your palm and then gently scatter them across the surface of the soil, trying to sow them as evenly as you can. Don’t worry if some seeds group themselves or do not appear to be evenly situated because as seed’s grow you can prick them out, allowing the healthiest plants to continue. Poppy seeds often germinate very quickly when sown in seed trays which are placed on a warm windowsill. It is important to keep the soil moist and this is best done by filling the seed tray container instead of pouring water directly onto the soil. This allows water to move up through the soil to the seeds and developing roots, rather than applying a stream of liquid to the surface which can disrupt seeds from their position and affect growing. In a warm and moist environment poppies will quickly begin to grow. Any seeds that develop mould should be removed so that they don’t affect others, whilst any seedlings which have not germinated properly or seemed stunted compared to the others can be pricked out immediately. After germinating and producing their very first leaves, plants will grow their first proper leaves. At this stage, if seedlings are close together, you can prick them out using a small pencil or something similar to lift each plant whilst gently holding onto the leaves to help remove the plant from the compost. Carefully place them in a pot of their own, water well, and continue to grow on. This method can be used for all your tiny Papaver somniferum seedlings, repotting as necessary as each individual plant grows. Once the last frosts have disappeared you can then place the young plants into your garden, where they will vigorously grow, often flowering before those sown in situ so that you get an early cascade of color. 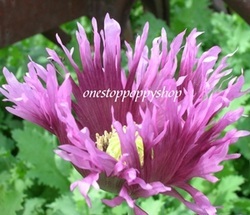 For buying poppy seeds online visit One Stop Poppy Shoppe for more than 50 varieties of these wonderful plants.